Kashmir, Mumbai Attack, Kargil days, Infiltration, Ceasefire violation. The perception of an average Indian about Pakistan fills with the above fore. State-sponsored terrorism of Pakistan and the training grounds for these terrorists in Pakistan soil create major impediments in resolving the worst diplomatic issue in the planet. In this capitalism-dominated world, where MNCs play bigger and dominant role than nation-states, India cannot still afford playing this military game with its ‘brother-enemy’. Large chunk of Indian young population demands employment opportunities (30,000 new youngsters enter into Indian labour market as job-seekers daily!) and have ire towards diverting its resources towards van guarding the border, superfluously. The section of international affairs and diplomacy in Indian libraries has overwhelmingly more books on Pakistan than any else. Both the nations, though share commonness and homogeneity in its culture, taste, preferences and so on. No other nation share the continuum as such Pakistan has, to India. Still, the relation is asphyxiated. History of modern nations reveals that it is simpler to substitute the impeding enmity between nations with increasing trade relations to scale down the bruises. Co-operation, once established, makes little grounds for the sustainability of militant activity which threatens both nations alike, economically. Thus, the necessity for the establishment of trade relations in full-fledged manner is a necessity for these former third world countries. Currently, the huge potential of trade lies untapped. 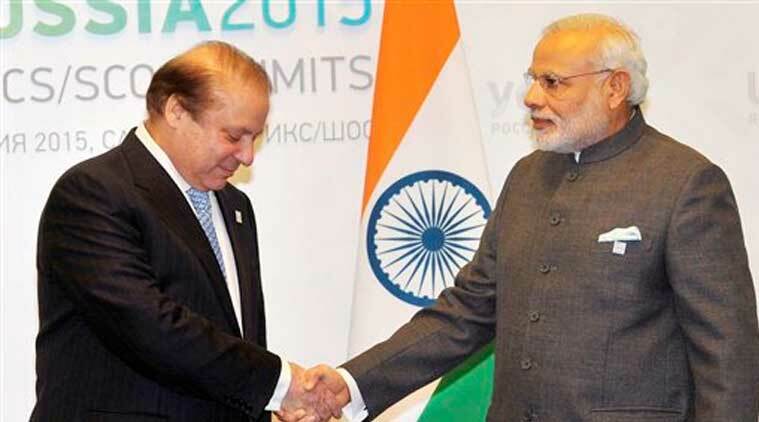 According to World Bank Report, India-Pakistan trade can be raised up to $37 billion. Unfortunately, the formal trade is just $2.17 billion and informal trade is at double of formal, i.e. $4.71 billion. The potential of boosting the trade between the countries is immense. The ICRIER research shows that trade can be boosted towards mutual benefit in a number of sectors such as medical tourism, agricultural trade, textiles and clothing and the automobile sector. Just after independence both nations had very high level of bilateral trade. As USAID report shows, in 1947-48, 23.6% of total Pakistani’s import came from India. From such high levels, as the relations between the two countries soured, the bilateral trade started to decline, plunging to zero just after the 1965 war. Almost 3 decades the condition was near stagnant to zero. It started to revive in 1996 when India accorded Most-Favored Nation (MFN) to Pakistan, under WTO guidelines. But unfortunately Pakistan did not reciprocate to it even after 22 years. This is the only case in the world where a unilateral MFN status exists. The geopolitical location of India and Pakistan is strategic in Indian Ocean’s Sea lanes of Communication (SLOC). The ports along Makran coast and Gujarat coast along with Mumbai can be leveraged as major entrepot for Suez canal-bound ships. Mutual benefit can be buttressed between the littoral states of Baluchistan, Sindh and that of Gujarat, Maharashtra and Western coast of India, in general. The talks of trade and co-operation should begin from the engagements between Gujarat, industrial hub of India and Baluch, natural resource-rich province of Pakistan, rather than conventional New Delhi-Islamabad line. This trade route will pave way for constant supply of various raw materials and energy supplies for Gujarat’s industries. The talk should also be fastened up for the implementation of Turkmenistan-Afghanistan-Pakistan-India (TAPI) natural gas pipeline which will enormously help in meeting the energy requirements of North India. The deal has already been worked out and is in implementation phase in all countries except between Pakistan and India. Delay in its implementation is of paramount significance as it adversely affects nation’s energy requirements. Recently the trade shows positive signs of taking up pace with increasing the trade from marginal $0.34 million in 2003-04 to $2.61 billion in 2015-16. The swearing-in ceremony of new Pakistan Prime Minister, Imran Khan brings in array of hopes. His first tweet assured about the building of peace through co-operation and trade between these nations. He is much familiar figure across borders through the subcontinent’s favourite game, cricket. The participation of Indian leader, Navjot Singh Sidhu, Punjab minister in the swearing-in ceremony of Imran Khan was an unprecedented friendly gesture. This was followed up by the opening up of Katarpur Sahib Corridor to allow Sikh pilgrims from India to visit the shrine visa-free and without passport. These trans-national projects, burgeoning bilateral trade and the recently concluded joint military exercise “Peace Mission 2018”, under the aegis of Shanghai Cooperation Organisation (SCO) in Russia, will expand the opportunities to narrow down the tensions between India and Pakistan and will bring fresh breeze to a bright South Asian Future. Abulrazak Gurnah, UK based Tanzanian novelist and academician rightly notes, “Trade delivers peace and prosperity. Trade is the great equalizer among people and nations; it does more than perhaps any other activity to prevent war”. Sharia and secular nation state; locating Muslim women’s rights. Be the first to comment on "Vitality of trade in India-Pakistan relation"